If you have never bought vegetable seeds before, it can be overwhelming. You have decided what you want to plant, and you head to the nursery with list in hand, but when you get there, you are confronted by gigantic racks with hundreds of seed packets. These are usually in alphabetical order, which makes it pretty easy to find the veggie you want, but when you get to the T’s, you discover they have 50 varieties of tomatoes, packaged by 8 different seed companies… It’s a lot. How deep to plant seeds. How far apart to plant them. 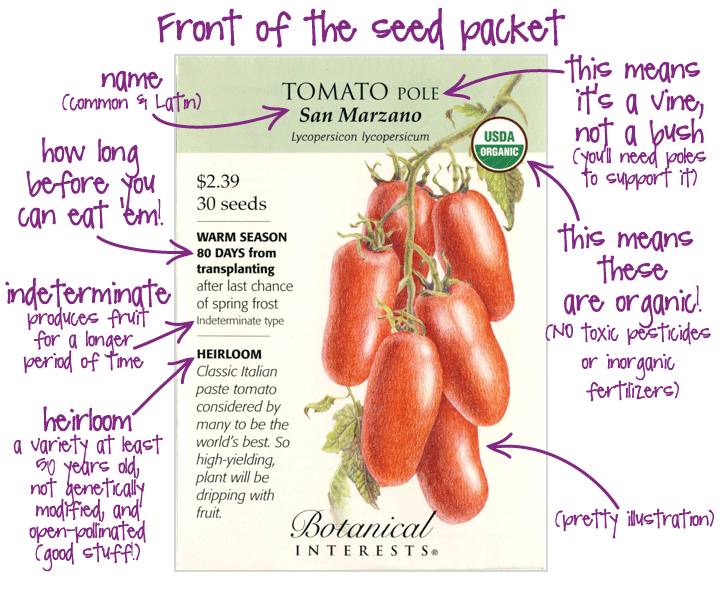 This is actually under the “Thinning” section on these packets, NOT the “Seed Spacing” section. I suggest planting your seeds at this distance from the get-go, then there is no thinning later! Important Note! 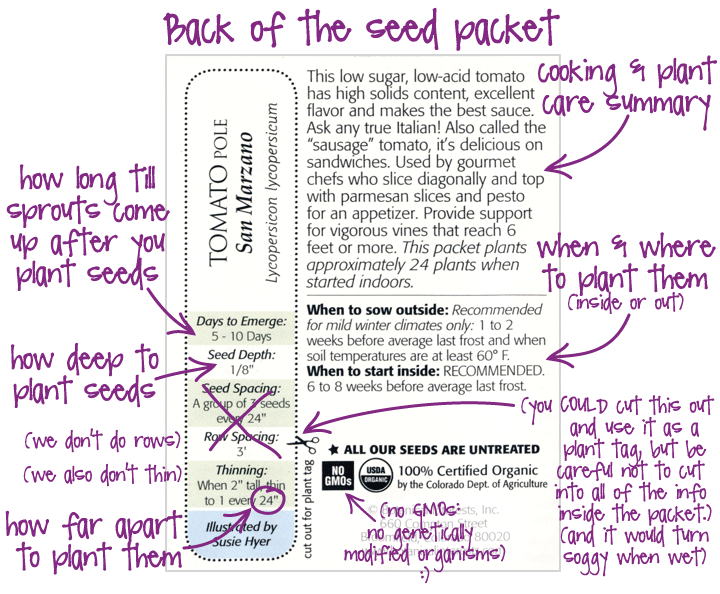 When you get home, don’t just rip into these packages–make sure you open them carefully, because the inside is also filled with useful info, a drawing of the sprout (in case you forget to mark your seedlings), harvesting details, further cooking tips, and sometimes even some trivia about the veg. I love seeds. Seeds are the first indication that the gardening season is indeed returning, even if it’s currently 15 degrees and there is still snow on the ground. Seeds say, “Yes, you will be eating fresh tomatoes off the vine in just a few short months!” Seeds conjure memories of reading books in the Sky Chairs on the back porch. Seeds are the promise of a delicious summer. Hubby will tell you that, yes, I do in fact have a seed addiction. They call to me, drawing me into their seemingly innocent display stands, and I am absolutely compelled to bring the poor little babies home with me. It’s worse than passing by the cheese counter at Tony’s or the clearance rack at DSW. Really. I usually end up planting WAY more seeds that we can actually use—or that we have room for in our itty bitty house. The kitchen becomes a mini-greenhouse, with trays of seeds on every surface near a window. (It really is a problem.) Luckily, I have lots of friends who don’t grow plants from seed, but are more than happy to take extra seedlings off my hands. I can only hope they give my babies good homes. This is the planning stage. I usually start this part around January 24, right about the time we are getting that fourth snow storm since the holidays, I just finally put away that last Christmas decoration I kept not seeing, and I am completely over wearing boots and sweaters (and I love my boots and sweaters). I might be jumping the gun just a bit, but you do want to have a plan before you get out there and start digging. First, ask yourself: What do I love to eat? If you really don’t like the texture of eggplant, don’t plant it. Do you eat a salad every night with dinner? Then lettuce is a must! Make a list, and prioritize. Second, if you haven’t already, go measure that garden area. Plants need room to grow–some more than others. You can get over 500 carrots in the same space that one tomato plant needs. If you have a very small space to work with, think about planting several vegetables that grow on small plants, rather than just a few larger plants. Traditional vegetable gardening has always been done in rows, where you dig a trench in your soil, throw a bunch of seeds in the trench, and cover it up. 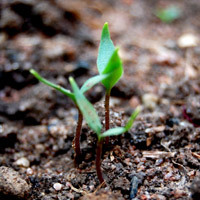 Then in two weeks, when the seedlings start coming up, you have a billion little plants that are all smashed together. Since veggie plants can’t grow that close together, you have to get down there on your hands and knees and pull all those extra little plants out. Doesn’t that sound wasteful (not to mention kinda painful)? It doesn’t take any longer—in fact, it will save you time, since you don’t have to go back through later and pull out the extra seedlings. You will use less seeds (and can save the rest for next year—more on that when I cover starting plants from seed). You can get more plants in less space. 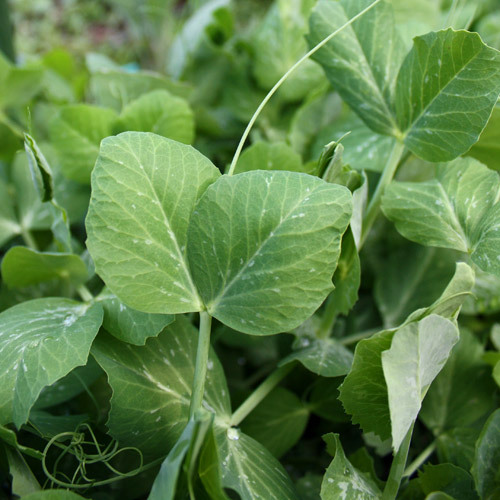 Don’t we all want as many fresh veggies as possible from our garden?